Sitka, 1884-1900. 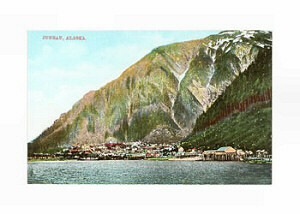 Juneau, since 1900. January 3, 1959, 49th State. 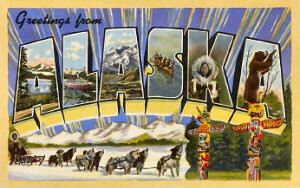 Border States: Alaska is not bordered by any other states. Most of Alaska is surrounded by water. To the north is the Arctic Ocean, (the Beaufort Sea and the Chukchi Sea). To the south is the Gulf of Alaska and Pacific Ocean. To the west is the Bering Sea. 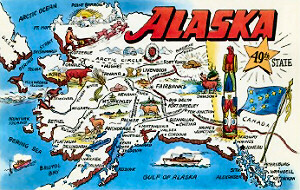 Alaska's land borders Canada to the east and south. Manufacturing: Food processing (fish products) is Alaska's leading manufacturing activity, in terms of value added by manufacture, followed by petroleum products. Services: Goverment services, public schools, public hospitals and military bases. Tourism is a major sector of Alaskas economy attracting over 1.1 million visitors annually. Mining: Oil provides about 95 percent of Alaska's mining income. Other mined products are gold, zinc, silver, coal, crushed stone, lead, molybdenum, and sand and gravel. Highest Point: Mt. 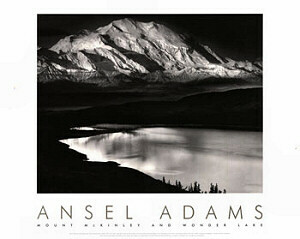 McKinley (Denali), 20,320 feet above sea level and the highest point in North America.